Shade that blocks 98% of the sun's UV rays, but not sea breezes or sunlight. A relaxing day at the beach with family or friends is about as close to perfection as life gets. But the same thing that makes it so awesome also keeps it from being 100% perfect: the sun. There's too much of it. 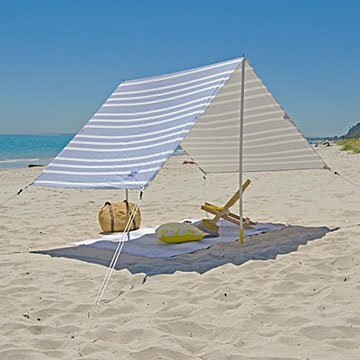 The shade provided by this simple, elegant cotton canvas tent blocks 98% of the sun's UV rays, and sea breezes flow right through it, bringing cool comfort. It's lightweight, and easy for one person to set up in a few minutes. Though the design offers a lot more shade area—up to 63 feet—than a beach umbrella, it also allows more light in, which is kind of the point of your day at the beach, right? Designed in Australia. Made in China. Click here to see the tent set up instructions. Canvas Tent Sheet: 10.8' x 5.9'; Assembled Tent Height: 5' 7"; Weight: 9 lbs; Bag: 3' L x 6" Dia. This was exactly what I was looking for- lightweight, easy to set up, absolutely no movement with wind except a beautiful breeze from the fabric. I was tired of always moving my chair around under my beach umbrella looking for shade as well as the constant fear of it blowing sway. I highly recommend! Gave this to my dad for his birthday. He recently relocated to a beach town, and needs more than a regular beach umbrella to protect him due to skin sensitivities. He loves it! The idea of this is fantastic but this product is so heavy, I can't imagine hauling to beach and I live in Cali. I returned without opening fully on weight alone. As a fair skin beach lover, I have tried many umbrellas, tents, etc. to get respite from direct sun at the beach. My family typically goes to Coney Island, NY, where the wind at the beach is pretty high. It is not unusual to see umbrellas uprooted and flying across the beach. I was very hopeful about this product, but my husband was dubious. We took this(via subway) to the beach for the first time yesterday, and the two of us were so impressed with how easy it was to assemble, how well it stayed up, and the amazing shelter it provided, without obstructing the view. At the end of the day, we took it down in about 3 minutes, packed it in it's lovely carry bag and took the subway home. Perfect beach day!